At Kernowcraft we offer a huge selection of drilled and undrilled natural rough crystals, minerals and semi precious tumbled polished gemstones. Using rough stones in jewellery making may seem daunting but using these beautiful gems creates gorgeous results - and it's easier than you may think! Whether you want to create a necklace or jaw-dropping ring, we’ve got six simple designs to get you started and spark some inspiration! Don't forget to take a look at our New Arrival section for even more goodies. A simple yet effective design with only a few tools needed! We've featured our stunning Madagascan Apatite Crystals in this particular design, adding a lovely pop of colour hidden within the wire wrap. 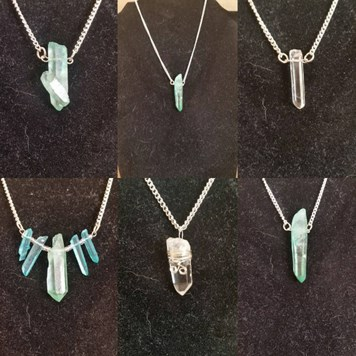 Unfortunately, these particular crystals are currently unavailable but this would work great with other crystals! 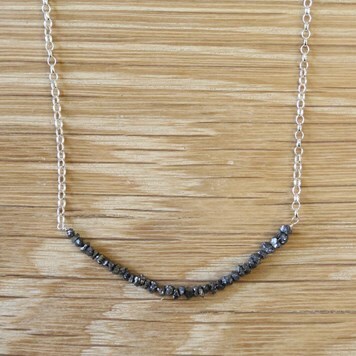 Bar necklaces are a popular design but why not use rough gems to really stand out? You can go wild with a mixture of gemstones of your choice, creating a modern design while also practising your basic wire wrapping skills in the process. For full step by step instructions and shopping list click here. With your chosen rough gemstones, you can get creative with wire wrapping for a truly dazzling effect. Our nugget beads are perfect for this contemporary design and certainly have the wow factor. Here we have used our silver diamond natural rough nugget beads to add that extra sparkle! Find full step by step instructions and shopping list here. 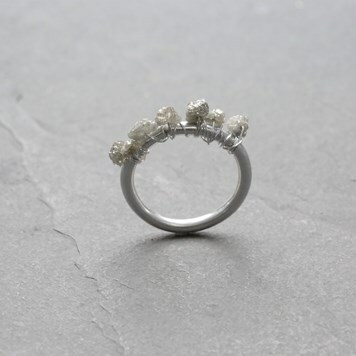 Prong claw settings are perfect for irregular shaped stones. 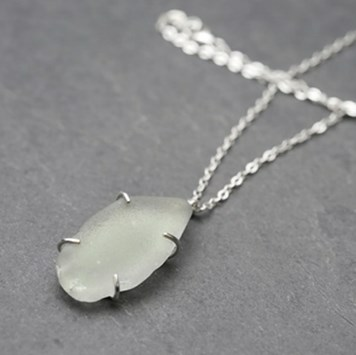 In this design, we're featuring sea glass and although this isn't a gemstone it shows just how great a claw setting is for those uniquely shaped materials. For full details and step by step instructions follow our guide here. 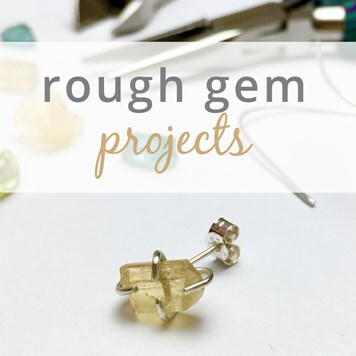 Rough gems make stunning focal points on earrings, so get creative with a unique design without the need of any specialist tools. All you need is earstuds with flat plates, your choice of rough stone, sanding sheet and glue. This is a really simple design and will only take you 20 minutes to make! We recommend using Devcon Epoxy Glue for this. Take a look at our range of crystals here. Need more inspiration? Take a look at some of our customer creations below! Don't forget to tag us in your #Kernowcraft creations on Facebook, Twitter and Instagram for your chance to be featured! For more 'Make The Look' designs head here! A beautiful wave ring featuring one of our rough apatite crystals. 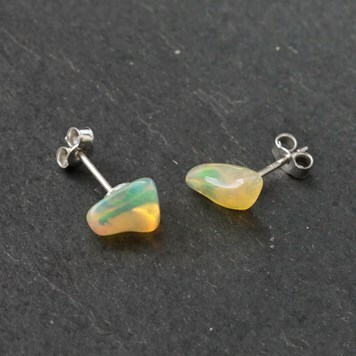 Check out these Ethiopian opal nugget stud earrings - so effective! A lovely design of wire wrapping one of our quartz crystal points. 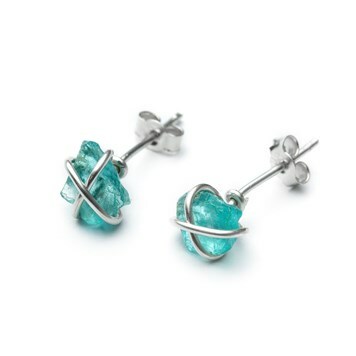 We're feeling beachy vibes with these rough aquamarine crystal earrings!